George Walter Rose (19 February 1920 – 5 May 1988) was an English actor and singer in theatre and film. Born in Bicester, Oxfordshire the son of a butcher, Rose studied at the Central School of Speech and Drama. After graduation he was briefly a farmer and secretary. After wartime service and studies at Oxford, he made his Old Vic stage debut in 1946. Rose spent four years with the Old Vic company and made his Broadway debut in a 1946 production of Henry IV, Part I and continued to play in New York City and London's West End for the remainder of the decade. He spent most of the 1950s appearing in broad comedy roles in the UK, later joining the Royal Shakespeare Company. He returned to Broadway to portray Dogberry in Much Ado About Nothing in 1959. Two years later, he co-starred to much acclaim in Robert Bolt's A Man For All Seasons, first in London and then in New York. This included Variety naming him best supporting actor for his portrayal of the Common Man. From then on he appeared primarily in American plays and films. Rose made his screen debut in Midnight Frolics in 1949 and went on to make more than 30 films. Notable film credits include The Pickwick Papers (1952), Track the Man Down (1955), A Night to Remember (1958), Hawaii (1966), and A New Leaf (1971). Rose starred in the 1975 television series Beacon Hill, an Americanised version of Upstairs, Downstairs. Other television credits include Naked City, Trials of O'Brien, the mini-series Holocaust (1978), and several appearances on the Hallmark Hall of Fame. On Broadway, among other roles, he played the First Gravedigger in John Gielgud's 1964 production of Hamlet starring Richard Burton, a suspicious storekeeper in William Hanley's Slow Dance on the Killing Ground (1964), a bitter soldier in Peter Shaffer's Royal Hunt of the Sun (1965), and the detective in Joe Orton's Loot (1968). His first Tony Award nomination was for his portrayal of Louis Greff, Coco Chanel's friend, in the musical Coco in 1969. In the 1974 comedy My Fat Friend, opposite Lynn Redgrave, he won a Drama Desk Award and received another Tony nomination. In 1976, he finally won a Tony as Alfred P. Doolittle in the Broadway revival of My Fair Lady. He received further acclaim in the role of General Burgoyne in The Devil's Disciple, as Mr. Darling and Captain Hook in Peter Pan and as one of the replacements for Rex Harrison in The Kingfisher; he won a 1979 Drama Desk Award for the last. In 1980, he appeared as Major General Stanley in the hit Joe Papp adaptation of The Pirates of Penzance, co-starring Kevin Kline and Linda Ronstadt, being nominated for another Tony award. He also starred in the film adaptation of the production, released in 1983. Rose won his second Tony in 1986, for Rupert Holmes' musical adaptation of The Mystery of Edwin Drood. 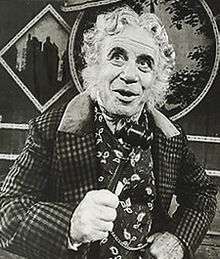 Rose was appearing in a national tour of Drood at the time of his death in 1988. His last film role was Pound Puppies and the Legend of Big Paw, in which he voiced the villain Marvin McNasty (and also sang one of the film's songs). Rose owned a pet lynx, birds and other exotic creatures. He had a music collection numbering around 17,000 records. In 1984, he purchased a holiday home in Sosúa, Dominican Republic, where he spent much of his time between his performances. Rose was gay and had no immediate family or permanent partner. He reportedly longed to have an heir. Shortly after moving, he took in a 14-year-old boy whom he supported financially and to whom he planned to leave his estate. He adopted the boy in January 1988. On 5 May 1988, during a two-week hiatus from the national tour of Drood, Rose was tortured and beaten to death by his adopted son, the boy's biological father, an uncle, and a friend of the father. The assailants tried to make the death look like a car accident, but soon confessed to killing Rose. Though all four men were charged and spent time in prison, no trial was ever held, and eventually all were released. Rose is buried in an unmarked grave in a cemetery near his holiday home in Sosúa. 1 2 3 4 Alix Kirsta (25 May 1997). "The Killing of Mr. George". The Sunday Times. Retrieved 7 June 2008. 1 2 3 4 Dennis Hevesi (13 May 1988). "Dominican Police Say 4 Men Killed George Rose". New York Times. Retrieved 7 June 2008. 1 2 3 Stevens, Christopher (2010). Born Brilliant: The Life Of Kenneth Williams. John Murray. p. 380. ISBN 1-84854-195-3. ↑ Cortland, T.S.H.P.T.S.U.N.Y. (2001). American Theatre : A Chronicle of Comedy and Drama, 1969-2000: A Chronicle of Comedy and Drama, 1969-2000. Oxford University Press, USA. p. 128. ISBN 9780195352559. Retrieved 11 December 2014. ↑ The Broadway League. "The Kingfisher | IBDB: The official source for Broadway Information". ibdb.com. Retrieved 11 December 2014. ↑ "George Rose Biography". filmreference. 2008. Retrieved 7 June 2008.